"Hibernating" since July 21, 2004, the SWAS mission has been reactivated to full science operations mode to provide support for the Deep Impact Mission. The SWAS spacecraft is healthy and has been taking data on Comet 9P/Tempel-1 since June 1, 2005 in order to establish the water production rate of the comet before the July 4 impact. A plot showing ground-state water emission observed toward the comet during the period June 5 - 15, 2005. 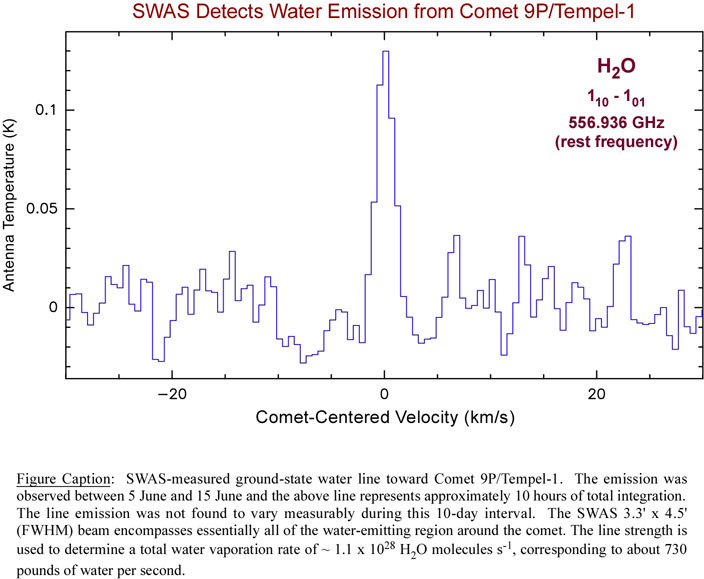 SWAS will continue to monitor water emission from the comet through August 2005. SWAS is a NASA Small Explorer Project (SMEX) designed to study the chemical composition of interstellar gas clouds. 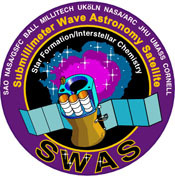 SWAS was launched into low Earth orbit on December 05, 1998. The primary objective of SWAS is to survey water, molecular oxygen, carbon, and isotopic carbon monoxide emission in a variety of galactic star forming regions. The SWAS Science Operations Center is located at the Harvard-Smithsonian Center for Astrophysics in Cambridge, Massachusetts.